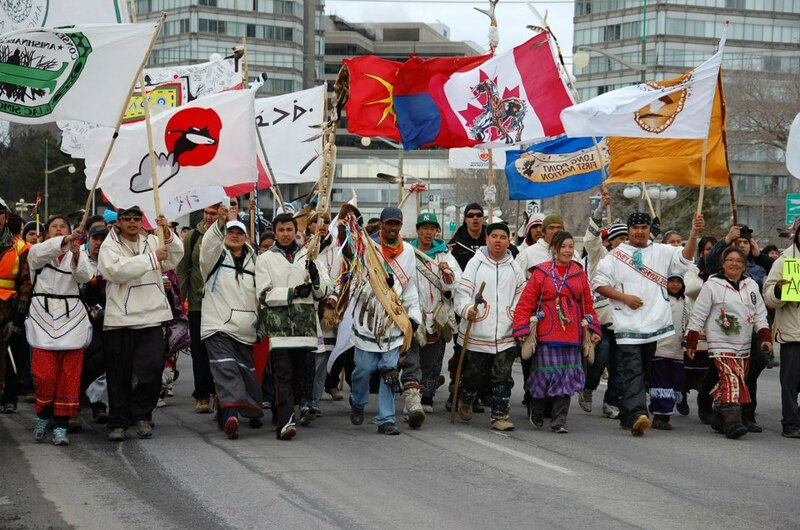 Cree walkers and supporters march in Ottawa, March 25, 2013. A group of young people from the James Bay Cree community of Whapmagoostui, Que., has arrived in Ottawa, marking the end of a 1,600-kilometre trek to the nation’s capital. “It’s just been a truly amazing experience. I’ll tell you, words cannot describe the feeling that I’m feeling, that the group is feeling, that the walkers are feeling,” said Lisa Commanda by phone Monday morning. She joined the group of walkers on Thursday when they reached the Kitigan Zibi Algonquin reserve in west Quebec. “We’re learning something from the young people,” Commanda said. Six youths and a guide left Whapmagoostui in January to snowshoe and walk to Ottawa in support of the Idle No More movement. They called the trek “The Journey of Nishiyuu,” which means “The Journey of the People” in Cree. The group now numbers nearly 400, according to volunteers and Gatineau police, after other children and youth from Cree and Algonquin communities joined them along the way. David Kawapit, 18, is one of the original seven walkers who set out from Whapmagoostui. Others on the walk have told Kawapit it’s helping them deal with personal struggles, Kawapit said, including depression and suicidal thoughts. Kawapit struggles with the same. “It feels really good that a lot of people are paying attention to what’s going on, and that a lot of these guys that are walking with us are helping themselves on this journey. Just before 9 a.m. Monday, the group left Chelsea. The first of the group began arriving at Victoria Island just after noon, where a welcome ceremony is taking place. The group will then complete their walk to Parliament Hill. At the Hill, the seven original walkers will make speeches, along with leaders of other First Nations communities that joined the walk. National Chief of the Assembly of First Nations, Shawn Atleo, will also speak, as will Attawapiskat Chief Teresa Spence. The leaders of the Council of Canadians and the Communications, Energy and Paperworkers Union said they will join the walkers as they finish their journey and said they support their message and are concerned the recent federal budget will undermine Aboriginal land and title. “We fully support the preservation of the Cree language, culture and tradition. And we now need to work together more than ever to protect the earth for our generation and future generations,” said Maude Barlow, the chair of the Council of Canadians. When “The Journey of Nishiyuu” arrived at Kitigan Zibi last week, 22 of the walkers sought medical attention at the community’s clinic for foot injuries. Three members of the group were also sent to hospital in nearby Maniwaki, Que., for further treatment. The group has received warm welcomes in the communities where its members have rested. Its Facebook group has more than 32,700 members. Posted on March 25, 2013, in Uncategorized and tagged #IdleNoMore, Cree, Idle No More, James Bay Cree, native protests, The Journey of Nishiyuu. Bookmark the permalink. 5 Comments. Reblogged this on Gam Gallery. to be happy. I’ve read this post and if I could I want to suggest you few interesting things or suggestions. Perhaps you could write next articles referring to this article. I desire to read even more things about it!